Allow me to be cranky for a moment. I am annoyed with the New York Times. 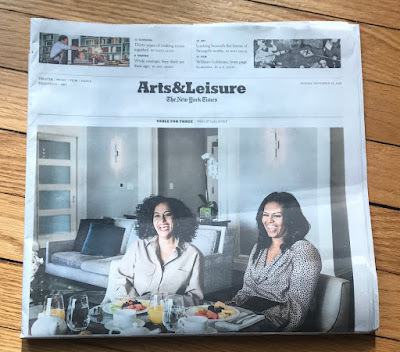 Today's Arts & Leisure section is modest - only 20 pages, only 12 articles. Of those 12 articles, nearly HALF - 5 out of 12 - are essentially dialogue. They are not fleshed out writing, they are "he said, she said" transcribed conversations. I'm sorry, but that just seems like a cop-out. Sure, once in a while, maybe once in every Sunday Arts & Leisure section, you can include a transcription, but in nearly half of the pieces? It's not just today's A&L. These "conversations" have been creeping in all over the paper. The most egregious iteration of this trend was a purported review of an actual new Broadway musical, in which, instead of writing a review, two of the theater critics had a conversation! Lord knows I don't want to see King Kong, but it feels like an over the top dis to not even give it a proper review.